In spite of this disavowal, the Brat Prince will soon be up to his vampirically regal neck in deaths, of both friend and foe. It begins when Lestat hears that a “gang of ugly blood drinker mavericks” have terrorized an old immortal living in the wilds of Louisiana. Going to investigate, he’s enchanted by Dmitri Fontayne, learning he’s an enemy of Arjun and has become a recluse for fear of being killed. Lestat offers to bring about a truce between the two but before he can act, he receives word that Marius has killed Arjun. Instead of the death solving the problem, it causes more because Marius demands to be judged for his crime. Though the others state he was justified in what he did, he insists they act as jury over him. The matter gets settled bloodlessly enough, but immediately another crisis arises. Without warning, the council demands that Lestat order Roshamandes’ death, something Lestat is hesitant to do. Though the five-thousand-year old vampire despises the prince, he has remained in the background, agreeing to keep a peace if left alone. Giving their reasons, they urge Lestat to have the order carried out and thus the Prince, the council, and all vampires under the Château de Lioncourt’s roof are swept up in a conflict that will end in many deaths and much destruction. Before the fight is over, Lestat will lose his blood mother, Marius, and his beloved Louis, and will come face-to-face with Gundesanth, the most ancient vampire in the world, he with the purest blood of them all. Lestat may say he doesn’t want to cause the deaths of his fellow undead but that’s what happens in this continuation of The Vampire Chronicles. In the opening pages of this continuation of Lestat’s biography—perhaps they should be termed an “apology” as used in the literary sense—the prince gives his reasons for reiterating his story, beginning with a graphically sensual description of himself that an ordinary mortal might describe as nothing other than self-conceit. Perhaps so, but that doesn’t actually justify the description of someone with “the boring appeal of a Matinee Idol rescued by a fierce and engaging expression.” The true reason, if there is one, is lost as his explanation meanders into his initial meeting with Dmitri Fontayne and the actual beginning of the story. In spite of that expository first chapter, the novel starts off interestingly enough, but soon devolves into one long battle with plenty of deaths, differentiated only by whoever is the current antagonist, and punctuated by long commentary. Between each conflict, there’s plenty of discussion, so much that the reader may come to the conclusion that vampires, like elderly humans, spend a great deal of time sitting around ruminating. 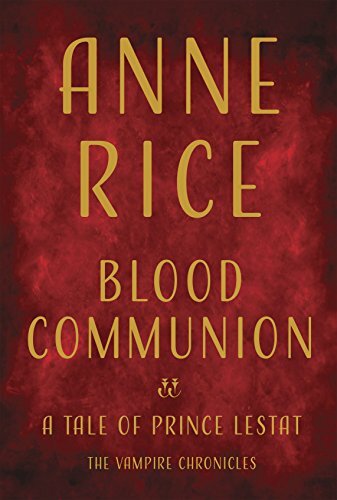 It seems each and every character created by author Rice has to have a say in what’s going on, so much so in fact, that some of the narration appears nothing more than a roll call of names, and may tempt the reader to commit what the devotee would term a sin—skimming the pages. What ever happened to the novel of one main character and two to three secondary ones and all the others mentioned in passing? For anyone not up on The Vampire Chronicles entourage through being new to the series, or having missed an entry, the upcoming Alphabettery of the Vampire Chronicles will be a long-awaited guide to clarity for those hapless readers. In the meantime, read carefully and don’t blink, or how Lestat survives the attacks on him and his, and succeeds in bringing about his long-desired Blood Communion may well be overlooked.